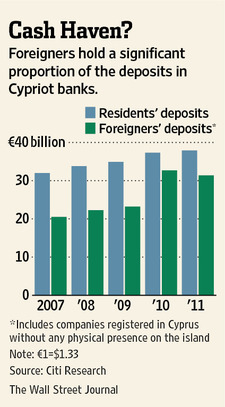 A flap over a potential bailout for Cyprus is heightening anxieties that the tiny island's economy could become the next flash point in the euro zone's debt crisis. A rescue program for Cyprus will require substantially reducing government and bank debt, Olli Rehn, the European Union's economics commissioner, said in an interview Thursday at the World Economic Forum in Davos, Switzerland, in a recognition that a more-conventional bailout of the latest euro-zone country to hit financial difficulties would leave it with too much debt. The rescue will also require a major restructuring of the country's banking system that may lead some banks to be wound down or merged, Mr. Rehn said. The rescue has already been delayed by six months because of disagreements among the Cypriot government, the International Monetary Fund and governments in the 17-nation currency union. The admission that Cyprus, which accounts for just 0.2% of the euro zone's economy, will require debt reduction came as other officials reported continuing divisions among prospective contributors to the rescue program.